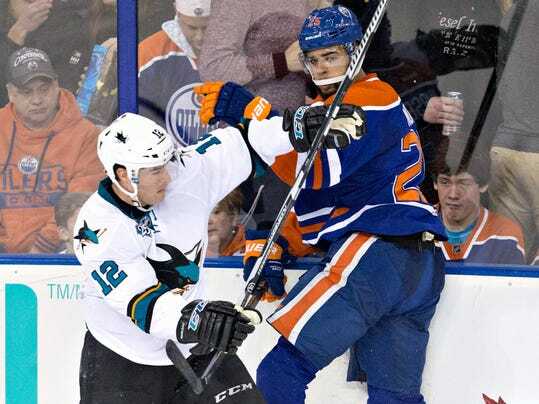 EDMONTON, Alberta (AP) — Edmonton Oilers defenseman Darnell Nurse will have a hearing with the NHL’s department of player safety for being the aggressor in an altercation with Roman Polak of the San Jose Sharks. The league announced that the hearing would be held Thursday. Nurse instigated a fight with Polak on Tuesday night, punching him before he had a chance to get his gloves off. Nurse took exception to an earlier hit Polak made on Edmonton forward Matt Hendricks. Nurse was given only a five-minute major for fighting and two-minute minor for roughing as a result of the incident late in the third period of the Oilers’ 3-0 loss. The 21-year-old Nurse has played in 61 NHL games, 59 this season. He has no previous disciplinary record.